Scientists look to the wild relatives of sunflowers and other crops to secure our food supply against the ravages of climate change. Plant physiologist Laura Marek collects wild sunflowers and stores their seeds at the USDA's Plant Introduction Station in Ames, IA. Marek, a plant physiologist, climbs out, clips a small GPS unit to her belt, and secures the floppy hat and biker glasses that shield her from the desert sun. 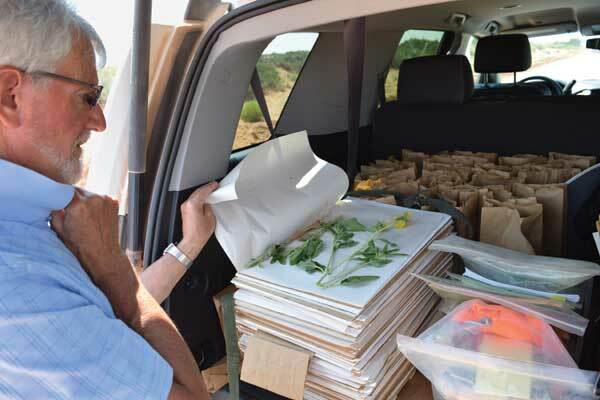 She and Gerald Seiler, a research botanist, grab their low-tech collecting gear: garden gloves and paper lunch bags. Within seconds, the two sixtysomethings are scrambling up the dunes, using their hands for balance in the shifting sand. “Aha!” Marek lets out a small yelp of delight as she nears the yellow patch, convinced they’ve found their quarry. It is Helianthus anomalus, a rare and elusive sunflower that grows only in the dunes and hummocks of the southwestern desert. The plants’ thick, hairy stems emerge sturdily from the sand, apparently undeterred on this arid June morning. Marek and Seiler set off in opposite directions, moving quickly as they snap seed-filled heads off the mature plants and drop them into their bags. To boat-towing tourists motoring by on their way to nearby Lake Powell, it probably looks like some vacationing couple has stopped to smell the flowers. In fact, Marek and Seiler are helping to safeguard the future of agriculture. 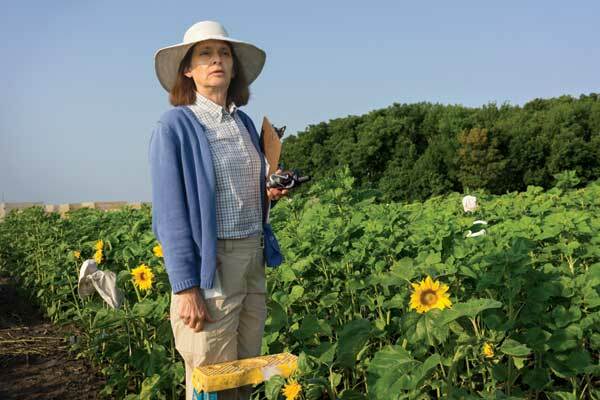 Laura Marek uses the compass function on her GPS to measure the angles of sunflower heads in her Iowa test fields. Gerald Seiler, of the USDA’s Northern Crop Science Laboratory in Fargo, ND, preserves wild sunflowers between sheets of paper and cardboard. 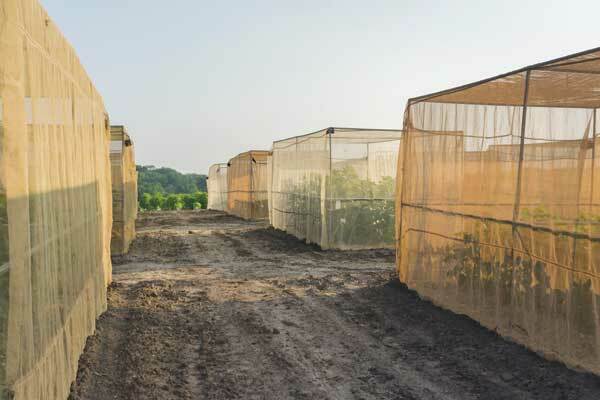 As the weather becomes increasingly unpredictable due to climate change, plant breeders face the monumental challenge of ensuring that crops will be able to thrive under constantly shifting conditions. 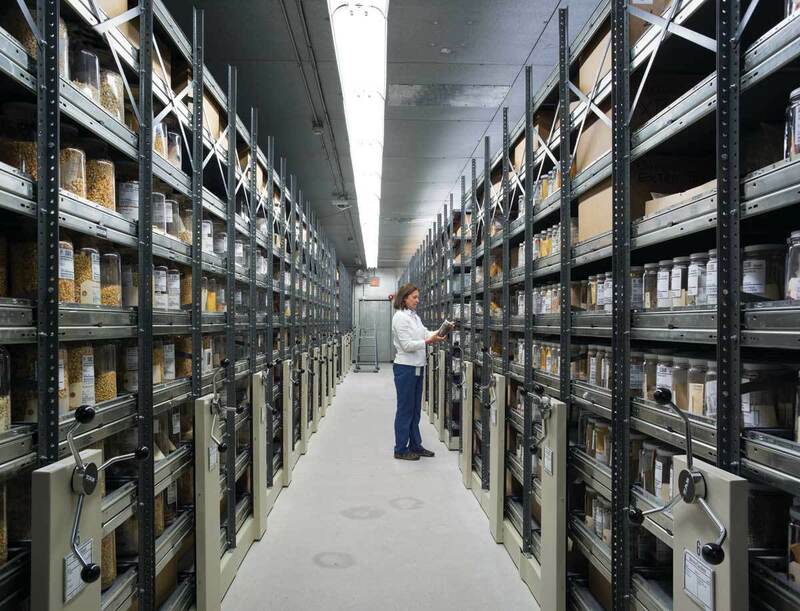 “Creating hybrids used to entail breeding for specific environments,” explains Marek, the curator of the oilseed collection at the U.S. Department of Agriculture’s Plant Introduction Station, in Ames, Iowa. Today, there’s no such thing as a single stable environment, and breeders are after hybrids that can survive long hot spells followed by sudden frosts, say, or drought one day and flooding the next. Diversity is the key to making that happen, and harnessing the genetics of wild species like H. anomalus is a step toward achieving that goal. Native to North America, sunflowers are an important source of cooking oil in many parts of the world. Sunflowers are the world’s second-most cultivated hybrid seed crop (after corn), and sunflower oil is a dietary staple in China, Russia, Ukraine, and Argentina, to name but a few countries. Though U.S. farms represent just 3 percent of global sunflower production, the plant is native to North America. In other words, the wild genetic material that breeders need to adapt the crop for future uncertainty is found almost exclusively on our soil. Incredibly heat- and drought-tolerant, H. anomalus flowers early in the spring and again come late summer – before and after the worst of the heat – and matures quickly, a trait that could give farmers protection from the killing frosts of late fall. With larger seeds and a higher oil content than any other wild sunflower, the species carries genetic resistance to broomrape, a parasitic plant that cannibalizes sunflower roots. At Iowa’s Plant Introduction Station, germinated seedlings of from left wild Helianthus anomalus, wild Helianthus annuus, and a cultivar of H. annuus are arranged on water-saturated blotter paper and monitored regularly for viability. 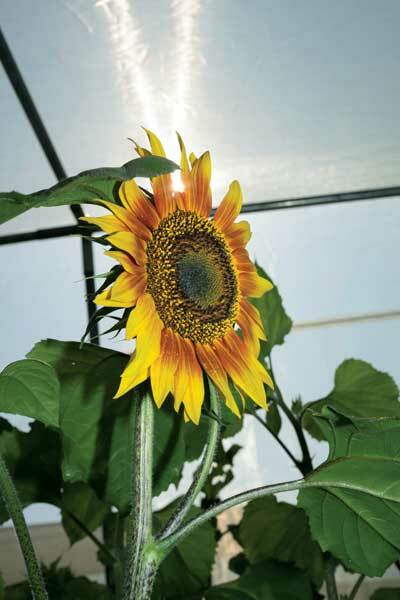 Different species of sunflowers are grown in separate cages to prevent cross-pollination. Marek and Seiler, who works at the USDA Agricultural Research Service’s Northern Crop Science Laboratory, in Fargo, North Dakota, have spent the last 11 years traversing the American outback – from the deserts of eastern Oregon to the Florida coasts – in search of wild sunflowers. During the duo’s recent swing through Utah and Arizona, they gathered four different species in 20 distinct locations spread out over 2,300 miles. The scientists have encountered Tennessee churchgoers who suggested that a poorly chosen parking spot might result in busted car windows. They’ve collected on an army base in Georgia during an urban-warfare training exercise, traveling in a Jeep marked with the United Nations logo to keep soldiers from shooting at them. And they’ve been stonewalled by irate New Mexican landowners who were afraid that the discovery of a threatened species on their property could bring federal regulation. Even Native American tribes have been suspicious: While some have allowed the pair access, others have denied their requests over concerns about forfeiting intellectual property – in the form of plant genetics – to the U.S. government. Lending further urgency is that climate change itself could threaten wild species before researchers have a chance to collect them. After tromping around the Utah dunes for 20 minutes, Marek and Seiler return to the car with paper bags bulging and label each with a marker, scribbling down the date and species. Seiler breaks a yard-high plant into three pieces and presses them between cardboard for the USDA’s wild sunflower collection in North Dakota. The seed heads will go to Marek’s Iowa lab, where they’ll be dried and then tested for viability. 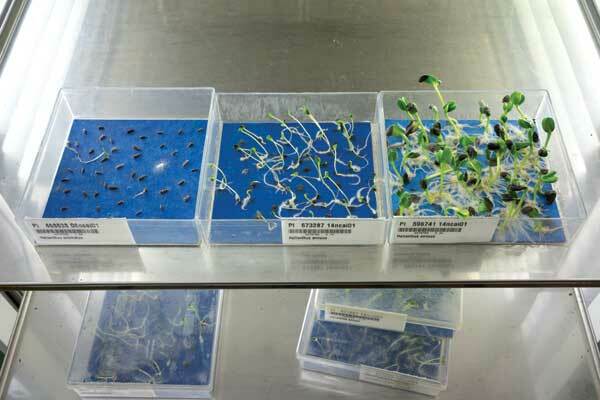 Some will be germinated and the seeds from those tested before being sent off to the National Center for Genetic Resources Preservation, in Fort Collins, Colorado, as well as a global seed bank in Norway. 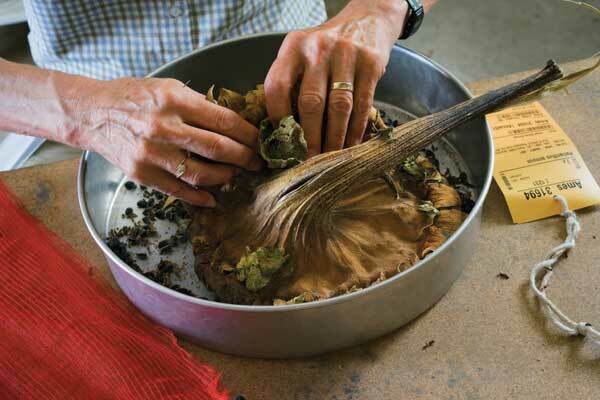 Marek removes seeds from a mature sunflower head. To counter the prospect, researchers from the Fort Collins gene bank have begun working with the U.S. Forest Service to develop a national strategy aimed at preserving the wild relatives of our nation’s crops. Over the next few years, the two organizations will map existing wild-relative populations in order to identify where stronger protections are needed. Then they’ll team with state governments and private landowners to enact those protections. Governments worldwide are engaged in similar battles against time and distance; as Marek and Seiler well know, genetic gold could lurk around any remote corner. Nelson Harvey, a former editor at Edible Aspen, writes about food, agriculture, water, and other environmental issues. This article was produced in collaboration with The Food & Environment Reporting Network, an independent, nonprofit news organization.